Host Brian Bowersock of West Automotive Group, which operates West Escondido, West El Cajon, and West Kearny Mesa Automotive & Transmission, and co-host Dan Mulgrew of Miramar 76 Service Center & Transmissions come together for an hour every Saturday morning to discuss your automotive questions on 760 KFMB Auto Talk Radio. The popular segment covers everything from spark plugs to transmission issues and everything in between. With much experience in the automotive industry, this is the show you listen to when you want to hear the experts talk. Both Brian Bowersock and Dan Mulgrew have extensive backgrounds in the automotive industry, and they are still working in it, which means they know all about the latest industry trends and news. Auto Talk radio dives into that complex thing you drive every day. Bowersock and Mulgrew are able to take the complexities of your vehicle and explain them to their listening audience in a way that everyone can understand. If the question you have about your vehicle isn’t answered on the scheduled podcast, listeners are encouraged to call in to 800-760-KFMB (800-760-5362) and ask those questions. The goal of Auto Talk Radio is to educate listeners about their vehicles, so they feel empowered when they go to get their cars repaired, or even go to buy a new one! Past topics Bowersock and Mulgrew have covered include extended warranties, how to prevent your vehicle from overheating in hot summer temperatures and ten maintenance mistakes that can seriously damage your vehicle. The information shared on the podcast is information all drivers can benefit from. 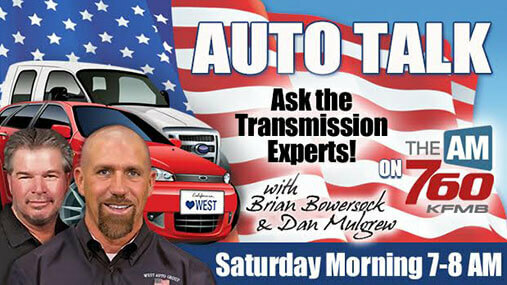 For answers to all your automotive questions, tune into 760 KFMB Auto Talk Radio on Saturday mornings from 7 – 8 a.m.! And, if you’re not an early riser or aren’t in the area, you can visit Auto Talk Radio to download our podcast, so you can listen later. If you have any questions you’d like answered on the show or topics you would like to hear more about, email them to autotalk@westautomotivegroup.com. Auto repair cost V’s Price and what does this mean? Fuel Induction Service W/ Carbon removal!